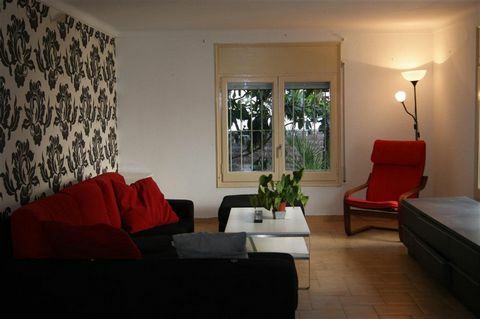 This holiday apartment is located in Rosas, Costa Brava, in the province of Gerona, Catalonia. The accommodation is part of a suburban residential neighborhood and lies just 2 km from the sandy beach, 1.50 km from the city, a supermarket and the bus station, and 20 km from the train station. Rosas is located on the northern coast of the Gulf of Roses, south of Cape Creus and is a major tourist center with modern hotels, beautiful beaches and two ports (fishing and yachting). The coast of Roses includes a long sandy beach while further east you1l find a large number of coves, among them Canyelles Petites, L'Almadrava, Cap Norfeu, Punta Falconera, Jóncols and Montjoi. Some of its beaches have received the Blue Flag award, a symbol of the quality of the environment. This two-bedroom apartment has a capacity for up to 6 persons and an area of 50 m². One of the bedrooms is furnished with a double bed, the other has two single beds. The living room is furnished with a double bed sofa. There is a bathroom with a bathtub. The independent kitchen is equipped with a gas hob, refrigerator, microwave, oven, washing machine, dishes/cutlery and kitchen utensils. Furthermore, this accommodation offers: a terrace, iron, communal swimming pool, open-air car park in the same building, a TV and Internet connection (for a fee). A baby bed can be rented. Roses is an essentially Mediterranean town with a notable tourist and seafaring tradition. It occupies a unique natural setting, in the northern part of the Costa Brava, less than 30 km from the French border, 65 km from Girona and 160 km from Barcelona. The major tourist center, with housing developments, hotels, beaches and two ports (fishing and sports), is an attractive place within the northern sector of the Costa Brava. The coastline of Roses includes a long sandy beach. Roses is a bustling town year round. Its range of activities and attractions is very appealing to all types of travelers. Drive a go-kart, enjoy a day at the water park, play mini-golf, take a boat trip to Cape Creus or a ride on a tourist train – these are just some of the possibilities Roses offers for your leisure time enjoyment. IMPORTANT: After making the reservation, please send us the following information: complete name, passport or ID number and date of birth for all tenants. RENTAL COST. The rental cost is the one indicated in the particular conditions of the booking's confirmation or contract, where the costs for rent, administration and all the extra services that the client has contracted are stated. RECEIVING THE KEY. When he is handed the key the client will pay the rest of the amount stipulated in the reservation contract, in cash only, and will sign the corresponding holiday rental agreement for the contracted period. RENTING PERIOD. The period for which the accommodation is rented is specified in the contract's private conditions, the keys will be handed between the hours of 16:00 and 20:00 from the first day of the contracted period, in case it is absolutely impossible for the client to arrive within the above mentioned hours, there will be a 50,00 € fee and the owner has to be informed with regards to the foreseen arrival time so the staff can adjust to the mentioned schedule changes. We do not hand over the keys after 22h, in case the client arrives later, he will have to pick up the key the next day in the morning. In any other case the owner is free from any obligations, the lessee losing the payment that he made when confirming the booking. The departure will be on the established day before 10:00 am, the owner has to be informed 24 hours in advance with regards to the exact hour of departure, the tenant being responsible for leaving the accommodation keys in our office and also for leaving the accommodation in the same condition as found. DEPOSIT. When handed the keys, the tenant will sign a document that authorizes the company to charge a fee from his credit card for the amount indicated as a warranty. At the end of his stay, the client agrees to turn in the accommodation, the furniture and the utilities in the same condition they were found in, making himself responsible for any damages that occur during his stay as a result of his actions including damages caused by any pets. Otherwise, the amount corresponding to cleaning, fixing or substituting any of such damages will be taken from the warranty deposit. ADMINISTRATION COSTS. The contract issuance costs are included in it, under the name of "administrative expenses" and the amount per day is of 6,00 € / day. SUPPLIES. The costs for supplies are included in the total price except for special cases that will be personally communicated to the client. In accommodations whose provisions are gas bottles and these become empty, the client has to contact the owner and take the bottle to him within opening hours, so that he can get a new one. COMMUNITY STANDARDS. The accommodations that are located in a community, with neighbors around, will have their own rules and regulations and/or ones of the community. If there are any community facilities like a pool, tennis courts, etc… they are not opened throughout the entire year, the dates in which they are open or closed depend on the weather, number of guests, hygiene routine and other factors. For this reason the owner will not be responsible for such facilities not being open within a community complex, for any factors that are not related to his management as an intermediate, the same way the clients will be responsible for their safety in using the mentioned facilities. RESOLUTION OF CONTRACT. The owner is entitled to terminate the contract in the following situations: 1. The excessive number of occupants in an accommodation, for which the owner may ask for the name and ID of each one of them at any point. 2. The transfer or subletting of the entire or part of the subject of this contract; 3. The changing of the furniture location within the accommodation; 4. The performance of any activity that contravenes the municipal regulations, the cohabitation regulations, the hygiene ones and the common public rules or of activities that deprive other tenants of the accommodation, complex or urbanization of rest. EXCLUDED LIABILITIES. The owner is not to be held responsible in the following situations: 1. Any theft, loss or damage that the clients may suffer during their stay in the rented accommodation, even in cases when they also rented a safe deposit box in their room. 2. Supply cuts from the larger companies such as electricity, gas or water; 3. The breakage of electromechanics or any other type of appliance in the accommodation will be reported to the owner and he will contact the Technical Department in less than 24 hours, but the lack of assistance from their part shall not be grounds for compensation from the owner. 4. Works that are developed by the city hall or any other institutions besides the owner's company, can be conducted nearby or in the same building and may affect the regular demarche of the tenant's stay. 5. The WiFi service comes from external companies that do not cover all of the apartments that the owner manages, thus in case the connection is deficient, the owner will refund the amount charged for the said service, prior to the supplier's authorization, without the client being able to blame the owner for the lack of connection. In case the client rents an accommodation and the said accommodation cannot be put at his disposal, the owner takes it upon himself to offer the client another accommodation of similar or higher category and in case the client is not satisfied with it, the amount of money that was paid to the owner for his intermediate management will be refunded. Option booking not available Please note: the rates do not include the mandatory hirers' liability insurance. This small amount is a percentage of the rental sum starting from 10 Euros per reservation. This property is located in one of the most idyllic areas of the Girona coast, a 5-minute walk from Canyelles Petites beach, where you can enjoy stunning views from the Bay of Roses. It is a comfortable apartment with a capacity of 4 people, ideal to enjoy in family or with friends of the many possibilities that la Costa Brava offers. Roses is an essentially Mediterranean city with a remarkable tradition of tourists and seafarers. It is located in a unique natural environment, in the northern part of the Costa Brava, less than 30 km from the French border, 65 km from Girona and 160 km from Barcelona. The main tourist center, with housing, hotels, beaches and two ports (fishing and sport), is an attractive place in the northern sector of the Costa Brava. The coastline of Roses has a long sandy beach. Roses is a bustling city throughout the year. The range of activities and attractions is very attractive for all types of travelers. Drive a go-kart, enjoy a day in the water park, play mini-golf, take a boat trip to Cape Creus or take a ride on a tourist train - these are just some of the possibilities that Roses offers for your pleasure. Important; After making the reservation you must send us the following information; complete name, number of passport or ID and the date of birth of all tenants. Key transfer; During the key transfer, the customer pays the rest of the amount as stated in the reservation contract, in cash and the customer signs the corresponding holiday rental agreement for the agreed period. Rental period; The rental period of the accommodation is stated in the contract's own terms and conditions, the key collection is between 4 and 8 p.m. from the first day of the agreed period. If the customer can not arrive within these hours, this customer pays 50 euros as an extra charge. The owner must be informed with information about the expected time of arrival so that the employees can adjust their working hours. Key collection is not possible after 22.00, if the customer arrives later, he or she can return the next day in the morning. In any other case the owner has no obligations, the tenant loses the payment he made when confirming the booking. Departure is on the fixed day until 10.00, you must inform the owner about the hour of departure, 24 hours in advance. The tenant is responsible for leaving the keys in our office, he or she must leave the accommodation in the same condition as on arrival. Deposit; With the key transfer, the tenant signs a document, giving the company the right to use your credit card to pay for a guarantee. At the end of the stay, the customer transfers the accommodation, the furniture and the amenities in the same condition as on arrival, the tenant is responsible for any damage caused during the stay, this also applies to the damage caused by a pet. In addition, the amount corresponds with costs for cleaning, repair or replacement of the damage, these are deducted from the deposit. Administration costs; The issuance of the contract is included in the price, stating administrative costs and you pay 6 euros per day. Services; The costs for facilities are included in the total price except in special cases, these are discussed personally with the customer. In the accommodations where gas bottles are used, the customer contacts the owner if the bottle is empty during opening hours, so that a new bottle is arranged. Code of conduct of the community; The accommodations in the community with neighbors have their own rules of conduct for the environment. The communal facilities such as a swimming pool or tennis courts are not open all year round, the dates when they are closed or open depend on the weather, the number of guests, hygienic conditions and other factors. That is also the reason why the owner is not responsible for these municipal facilities if they are not open due to various factors, these facilities do not fall under his management. The same applies to customers, they are responsible for their safety if they make use of these facilities. The termination of the contract; The owner can terminate the contract in the following situations; 1 For the extreme number of users of an accommodation, the owner can at any time inquire about the names and the identity card 2 The transfer or subletting of all or part of the subject of this contract; 3 Moving the furniture in the accommodation 4 Exhibiting activities that contravene the code of conduct of the community, rules of society, hygiene and the rules of public order and activities by the tenants who disrupt the peace of the complex and the neighborhood. Exceptions of obligations; The owner is not responsible for the following situations: 1 Any theft, loss or damage that the customers experience during their stay in the rented accommodation, even in cases where there is a rented safe in the room 2 Poor delivery of larger companies such as electricity, gas and water 3 A defect of electromechanical or other facilities in the accommodation will be passed on to the owner, and he will contact the technical department within 24 hours, a lack of service on their part will not be compensated by the owner. 4 The activities by the municipality or other agencies outside the company of the owner, can take place near or in the same building, this can have consequences for the daily routine during the stay of the tenants. 5 Access to Wifi is provided by external companies and there is not enough signal in each apartment of the owner. If the connection is insufficient, the owner will return the amount for the promised service, with the consent of the supplier, without the customer being able to speak to the owner about the bad connection. In case the customer hires an accommodation and the promised accommodation is not available, the owner must offer the customer another equivalent accommodation or better. If the customer is not satisfied with this, the owner must pay the amount for his intervention to the customer. Option booking not available Please note: the rates do not include the mandatory hirers' liability insurance. This small amount is a percentage of the rental sum starting from 10 Euros per reservation. This apartment is located in Rosas (Roses in Catalan), a Spanish municipality in the province of Gerona, Catalonia. Rosas is situated on the Costa Brava, the northernmost coast of the Gulf of Roses, south of Cape Creus. This accommodation offers a view of the sea and lies just 350 meters from a supermarket and the sandy beaches, 1.4 km from the city, 2.1 km from the bus station and 20 km from the train station. It is part of a suburban residential neighborhood. Roses is a major tourist center with modern hotels, beautiful beaches and two ports (fishing and yachting). The coast of Roses includes a long sandy beach while further east you'll find a large number of coves, among them Canyelles Petites, L'Almadrava, Cap Norfeu, Punta Falconera, Jóncols and Montjoi. Some of its beaches have received the Blue Flag award, a symbol of quality for having a clean and safe environment. This 71m² apartment has 2 bedrooms and is suitable for up to 6 persons. The bedrooms are simple but comfortable. One of them has a double bed, the other is furnished with two single beds. The living-dining room has a double bed sofa, TV, coffee table, armchair and a dining table with chairs. The independent kitchen is equipped with a gas hob, refrigerator, microwave, oven, washing machine, dishes/cutlery, kitchen utensils, coffeemaker and toaster. There is a bathroom with a bathtub. Furthermore, the accommodation comes equipped with the following facilities: garden furniture, a terrace, iron, outdoor car park in the same building and internet access (fee). Upon request you can rent a child bed. Roses is an essentially Mediterranean town with a notable tourist and seafaring tradition. It occupies a unique natural setting, in the northern part of the Costa Brava, less than 30 km from the French border, 65 km from Girona and 160 km from Barcelona. The major tourist center, with housing developments, hotels, beaches and two ports (fishing and sports), is an attractive place within the northern sector of the Costa Brava. The coastline of Roses includes a long sandy beach. Roses is a bustling town year round. Its range of activities and attractions is very appealing to all types of travelers. Drive a go-kart, enjoy a day at the water park, play mini-golf, take a boat trip to Cape Creus or a ride on a tourist train – these are just some of the possibilities Roses offers for your leisure time enjoyment. IMPORTANT: After making the reservation, please send us the following information: complete name, passport or ID number and date of birth for all tenants. RENTAL COST. The rental cost is the one indicated in the particular conditions of the booking's confirmation or contract, where the costs for rent, administration and all the extra services that the client has contracted are stated. RECEIVING THE KEY. When he is handed the key the client will pay the rest of the amount stipulated in the reservation contract, in cash only, and will sign the corresponding holiday rental agreement for the contracted period. RENTING PERIOD. The period for which the accommodation is rented is specified in the contract's private conditions, the keys will be handed between the hours of 16:00 and 20:00 from the first day of the contracted period, in case it is absolutely impossible for the client to arrive within the above mentioned hours, there will be a 50,00 € fee and the owner has to be informed with regards to the foreseen arrival time so the staff can adjust to the mentioned schedule changes. We do not hand over the keys after 22h, in case the client arrives later, he will have to pick up the key the next day in the morning. In any other case the owner is free from any obligations, the lessee losing the payment that he made when confirming the booking. The departure will be on the established day before 10:00 am, the owner has to be informed 24 hours in advance with regards to the exact hour of departure, the tenant being responsible for leaving the accommodation keys in our office and also for leaving the accommodation in the same condition as found. DEPOSIT. When handed the keys, the tenant will sign a document that authorizes the company to charge a fee from his credit card for the amount indicated as a warranty. At the end of his stay, the client agrees to turn in the accommodation, the furniture and the utilities in the same condition they were found in, making himself responsible for any damages that occur during his stay as a result of his actions including damages caused by any pets. Otherwise, the amount corresponding to cleaning, fixing or substituting any of such damages will be taken from the warranty deposit. ADMINISTRATION COSTS. The contract issuance costs are included in it, under the name of "administrative expenses" and the amount per day is of 6,00 € / day. SUPPLIES. The costs for supplies are included in the total price except for special cases that will be personally communicated to the client. In accommodations whose provisions are gas bottles and these become empty, the client has to contact the owner and take the bottle to him within opening hours, so that he can get a new one. COMMUNITY STANDARDS. The accommodations that are located in a community, with neighbors around, will have their own rules and regulations and/or ones of the community. If there are any community facilities like a pool, tennis courts, etc… they are not opened throughout the entire year, the dates in which they are open or closed depend on the weather, number of guests, hygiene routine and other factors. For this reason the owner will not be responsible for such facilities not being open within a community complex, for any factors that are not related to his management as an intermediate, the same way the clients will be responsible for their safety in using the mentioned facilities. RESOLUTION OF CONTRACT. The owner is entitled to terminate the contract in the following situations: 1. The excessive number of occupants in an accommodation, for which the owner may ask for the name and ID of each one of them at any point. 2. The transfer or subletting of the entire or part of the subject of this contract; 3. The changing of the furniture location within the accommodation; 4. The performance of any activity that contravenes the municipal regulations, the cohabitation regulations, the hygiene ones and the common public rules or of activities that deprive other tenants of the accommodation, complex or urbanization of rest. EXCLUDED LIABILITIES. The owner is not to be held responsible in the following situations: 1. Any theft, loss or damage that the clients may suffer during their stay in the rented accommodation, even in cases when they also rented a safe deposit box in their room. 2. Supply cuts from the larger companies such as electricity, gas or water; 3. The breakage of electromechanics or any other type of appliance in the accommodation will be reported to the owner and he will contact the Technical Department in less than 24 hours, but the lack of assistance from their part shall not be grounds for compensation from the owner. 4. Works that are developed by the city hall or any other institutions besides the owner's company, can be conducted nearby or in the same building and may affect the regular demarche of the tenant's stay. 5. The WiFi service comes from external companies that do not cover all of the apartments that the owner manages, thus in case the connection is deficient, the owner will refund the amount charged for the said service, prior to the supplier's authorization, without the client being able to blame the owner for the lack of connection. In case the client rents an accommodation and the said accommodation cannot be put at his disposal, the owner takes it upon himself to offer the client another accommodation of similar or higher category and in case the client is not satisfied with it, the amount of money that was paid to the owner for his intermediate management will be refunded. Option booking not available Please note: the rates do not include the mandatory hirers' liability insurance. This small amount is a percentage of the rental sum starting from 10 Euros per reservation. Beautiful villa consisting of 2 floors both with an independent entrance. A fantastic swimming pool with a lockable fence, so also ideal for protecting the little ones. This large house is ideal to go on holiday with a large family or friends and where everyone has their privacy. The studio is not included in the price and will be; if you rent the entire villa; not rented to other guests. The living in the ground floor as the first floor are fully equipped with kitchen, bathroom and whatever you need. A wonderful home for a great holiday The villa overlooking the bay of Roses is located in the urbanization Mas Fumats belonging to Rosas. The center of Rosas is a short distance away by car and the beaches are about 5 minutes away. The nice thing about this urbanization is that it is very quiet. Cities such as Figueres or Girona are easy to reach for a day trip. Port Lligat where Salvador Dalí used to have his home and which can still be visited or Cadaques are also worthwhile. Beautiful villa consisting of 2 floors both with an independent entrance and an adjacent studio. A fantastic swimming pool with a lockable fence, so also ideal for protecting the little ones. This large house is ideal to go on holiday with a large family or friends and where everyone has their privacy. The living in the ground floor as the first floor and studio are fully equipped with kitchen, bathroom and whatever you need. A wonderful home for a great holiday The villa overlooking the bay of Roses is located in the urbanization Mas Fumats belonging to Rosas. The center of Rosas is a short distance away by car and the beaches are about 5 minutes away. The nice thing about this urbanization is that it is very quiet. Cities such as Figueres or Girona are easy to reach for a day trip. Port Lligat where Salvador Dalí used to have his home and which can still be visited or Cadaques are also worthwhile. Nice studio apartment on the ground floor for 2 persons. Part of a beautiful villa consisting of 2 floors both with an independent entrance. A fantastic shared swimming pool with a lockable fence, so also ideal for protecting the little ones. This apartment is ideal to go on holiday in couple and where you will find your privacy. The apartment is fully equipped with kitchen, bathroom and whatever you need. A wonderful place for a great holiday The villa overlooking the bay of Roses is located in the urbanization Mas Fumats belonging to Rosas. The center of Rosas is a short distance away by car and the beaches are about 5 minutes away. The nice thing about this urbanization is that it is very quiet. Cities such as Figueres or Girona are easy to reach for a day trip. Port Lligat where Salvador Dalí used to have his home and which can still be visited or Cadaques are also worthwhile. Apart-Rent. Apartment with seaview ( 2006). The apartment in Rosas / Roses has 3 bedrooms and has capacity for 7 people. The apartment is 120 m². It has views of the sea. Roses: flat - 3 rooms - 6/7 personsfor your holidays in spain. Magnificent villa with stunning seaview. Magnificent modern house of 272m2 in a privileged area of Roses. Stunning seaview from all the rooms. Located in Gerona Province. Sublet.com Listing ID 2821323. For more information and pictures visit https:// ... /rent.asp and enter listing ID 2821323. Contact Sublet.com at ... if you have questions. Located in Gerona Province. Sublet.com Listing ID 2821309. For more information and pictures visit https:// ... /rent.asp and enter listing ID 2821309. Contact Sublet.com at ... if you have questions. Property with a capacity for 6 people. It has 2 bedrooms, 1 bathroom, American-style kitchen, terrace. Parking included. The accommodation is 700 meters from the beach, 17 km from Cadaqués, 2000 m from the city center and 2000 m from the bus station Roses is an essentially Mediterranean city with a remarkable tradition of tourists and seafarers. It is located in a unique natural environment, in the northern part of the Costa Brava, less than 30 km from the French border, 65 km from Girona and 160 km from Barcelona. The main tourist center, with housing, hotels, beaches and two ports (fishing and sport), is an attractive place in the northern sector of the Costa Brava. The coastline of Roses has a long sandy beach. Roses is a bustling city throughout the year. The range of activities and attractions is very attractive for all types of travelers. Drive a go-kart, enjoy a day in the water park, play mini-golf, take a boat trip to Cape Creus or take a ride on a tourist train - these are just some of the possibilities that Roses offers for your pleasure. Important; After making the reservation you must send us the following information; complete name, number of passport or ID and the date of birth of all tenants. Key transfer; During the key transfer, the customer pays the rest of the amount as stated in the reservation contract, in cash and the customer signs the corresponding holiday rental agreement for the agreed period. Rental period; The rental period of the accommodation is stated in the contract's own terms and conditions, the key collection is between 4 and 8 p.m. from the first day of the agreed period. If the customer can not arrive within these hours, this customer pays 50 euros as an extra charge. The owner must be informed with information about the expected time of arrival so that the employees can adjust their working hours. Key collection is not possible after 22.00, if the customer arrives later, he or she can return the next day in the morning. In any other case the owner has no obligations, the tenant loses the payment he made when confirming the booking. Departure is on the fixed day until 10.00, you must inform the owner about the hour of departure, 24 hours in advance. The tenant is responsible for leaving the keys in our office, he or she must leave the accommodation in the same condition as on arrival. Deposit; With the key transfer, the tenant signs a document, giving the company the right to use your credit card to pay for a guarantee. At the end of the stay, the customer transfers the accommodation, the furniture and the amenities in the same condition as on arrival, the tenant is responsible for any damage caused during the stay, this also applies to the damage caused by a pet. In addition, the amount corresponds with costs for cleaning, repair or replacement of the damage, these are deducted from the deposit. Administration costs; The issuance of the contract is included in the price, stating administrative costs and you pay 6 euros per day. Services; The costs for facilities are included in the total price except in special cases, these are discussed personally with the customer. In the accommodations where gas bottles are used, the customer contacts the owner if the bottle is empty during opening hours, so that a new bottle is arranged. Code of conduct of the community; The accommodations in the community with neighbors have their own rules of conduct for the environment. The communal facilities such as a swimming pool or tennis courts are not open all year round, the dates when they are closed or open depend on the weather, the number of guests, hygienic conditions and other factors. That is also the reason why the owner is not responsible for these municipal facilities if they are not open due to various factors, these facilities do not fall under his management. The same applies to customers, they are responsible for their safety if they make use of these facilities. The termination of the contract; The owner can terminate the contract in the following situations; 1 For the extreme number of users of an accommodation, the owner can at any time inquire about the names and the identity card 2 The transfer or subletting of all or part of the subject of this contract; 3 Moving the furniture in the accommodation 4 Exhibiting activities that contravene the code of conduct of the community, rules of society, hygiene and the rules of public order and activities by the tenants who disrupt the peace of the complex and the neighborhood. Exceptions of obligations; The owner is not responsible for the following situations: 1 Any theft, loss or damage that the customers experience during their stay in the rented accommodation, even in cases where there is a rented safe in the room 2 Poor delivery of larger companies such as electricity, gas and water 3 A defect of electromechanical or other facilities in the accommodation will be passed on to the owner, and he will contact the technical department within 24 hours, a lack of service on their part will not be compensated by the owner. 4 The activities by the municipality or other agencies outside the company of the owner, can take place near or in the same building, this can have consequences for the daily routine during the stay of the tenants. 5 Access to Wifi is provided by external companies and there is not enough signal in each apartment of the owner. If the connection is insufficient, the owner will return the amount for the promised service, with the consent of the supplier, without the customer being able to speak to the owner about the bad connection. In case the customer hires an accommodation and the promised accommodation is not available, the owner must offer the customer another equivalent accommodation or better. If the customer is not satisfied with this, the owner must pay the amount for his intervention to the customer. Option booking not available Please note: the rates do not include the mandatory hirers' liability insurance. This small amount is a percentage of the rental sum starting from 10 Euros per reservation. This accommodation is in one of the most idyllic areas of the Girona Coast, located just a 700 metres from the beach and 5 minutes driving from the Centre of Roses. It is a comfortable apartment with capacity for 6 people and has a private terrace where you can see the magnificent views of the Roses Bay. Ideal to enjoy in family or with friends of the multiple opportunities that offers la Costa Brava. Option booking not available Please note: the rates do not include the mandatory hirers' liability insurance. This small amount is a percentage of the rental sum starting from 10 Euros per reservation. Comfortable apartment with capacity for 6 people. Located in front of the fishing port of Roses, quiet but also centrally-located. Only at 200 meters are all kinds of shops and restaurants serving the best fresh fish and seafood from the Bay of Roses and less than 5 min driving are the sandy beaches with one of the most crystalline waters of the coast of Girona. Ideal to enjoy couple of the multiple possibilities that offers la Costa Brava. Option booking not available Please note: the rates do not include the mandatory hirers' liability insurance. This small amount is a percentage of the rental sum starting from 10 Euros per reservation. This cozy and spacious villa with views of the swimming pool and river is located in Rosas, Costa Brava, in the province of Gerona, Catalonia. Rosas is situated on the northern coast of the Gulf of Roses, south of Cape Creus. The accommodation is part of a family-oriented suburban neighborhood and lies just 100 meters from the sandy beach, 0.5 km from a supermarket, 2.5 km from the city, 3 km from the bus station and 20 km from the train station. Roses is a major tourist center with modern hotels, beautiful beaches and two ports (fishing and yachting). The coast of Roses includes a long sandy beach while further east you'll find a large number of coves, among them Canyelles Petites, L'Almadrava, Cap Norfeu, Punta Falconera, Jóncols and Montjoi. Some of its beaches have received the Blue Flag award, a symbol of quality for having a clean and safe environment. This spacious five-bedroom apartment has a capacity of 10 persons and an area of 150m². There are 3 bedrooms furnished with double beds and another two bedrooms furnished with single beds (4 single beds in total). There is a cozy living-dining room with a sitting area and a dining table with chairs. There are two bathrooms, each with a shower and another bathrooms with a bathtub. The open kitchen is equipped with a ceramic hob, refrigerator, microwave, oven, washing machine, dishwasher, dishes/cutlery, kitchen utensils, coffeemaker and toaster. Furthermore, the accommodation offers the following facilities: a garden, garden furniture, fenced yard, terrace, barbecue, fireplace, iron, central heating, air-conditioning in the bedrooms, private swimming pool, open-air car park (2 spaces) in the same building, a TV and Internet (use for a fee, upon request). Upon request you can also rent a child bed. Pets are allowed. Roses is an essentially Mediterranean town with a notable tourist and seafaring tradition. It occupies a unique natural setting, in the northern part of the Costa Brava, less than 30 km from the French border, 65 km from Girona and 160 km from Barcelona. The major tourist center, with housing developments, hotels, beaches and two ports (fishing and sports), is an attractive place within the northern sector of the Costa Brava. The coastline of Roses includes a long sandy beach. Roses is a bustling town year round. Its range of activities and attractions is very appealing to all types of travelers. Drive a go-kart, enjoy a day at the water park, play mini-golf, take a boat trip to Cape Creus or a ride on a tourist train – these are just some of the possibilities Roses offers for your leisure time enjoyment. IMPORTANT: After making the reservation, please send us the following information: complete name, passport or ID number and date of birth for all tenants. RENTAL COST. The rental cost is the one indicated in the particular conditions of the booking's confirmation or contract, where the costs for rent, administration and all the extra services that the client has contracted are stated. RECEIVING THE KEY. When he is handed the key the client will pay the rest of the amount stipulated in the reservation contract, in cash only, and will sign the corresponding holiday rental agreement for the contracted period. RENTING PERIOD. The period for which the accommodation is rented is specified in the contract's private conditions, the keys will be handed between the hours of 16:00 and 20:00 from the first day of the contracted period, in case it is absolutely impossible for the client to arrive within the above mentioned hours, there will be a 50,00 € fee and the owner has to be informed with regards to the foreseen arrival time so the staff can adjust to the mentioned schedule changes. We do not hand over the keys after 22h, in case the client arrives later, he will have to pick up the key the next day in the morning. In any other case the owner is free from any obligations, the lessee losing the payment that he made when confirming the booking. The departure will be on the established day before 10:00 am, the owner has to be informed 24 hours in advance with regards to the exact hour of departure, the tenant being responsible for leaving the accommodation keys in our office and also for leaving the accommodation in the same condition as found. DEPOSIT. When handed the keys, the tenant will sign a document that authorizes the company to charge a fee from his credit card for the amount indicated as a warranty. At the end of his stay, the client agrees to turn in the accommodation, the furniture and the utilities in the same condition they were found in, making himself responsible for any damages that occur during his stay as a result of his actions including damages caused by any pets. Otherwise, the amount corresponding to cleaning, fixing or substituting any of such damages will be taken from the warranty deposit. ADMINISTRATION COSTS. The contract issuance costs are included in it, under the name of "administrative expenses" and the amount per day is of 6,00 € / day. SUPPLIES. The costs for supplies are included in the total price except for special cases that will be personally communicated to the client. In accommodations whose provisions are gas bottles and these become empty, the client has to contact the owner and take the bottle to him within opening hours, so that he can get a new one. COMMUNITY STANDARDS. The accommodations that are located in a community, with neighbors around, will have their own rules and regulations and/or ones of the community. If there are any community facilities like a pool, tennis courts, etc… they are not opened throughout the entire year, the dates in which they are open or closed depend on the weather, number of guests, hygiene routine and other factors. For this reason the owner will not be responsible for such facilities not being open within a community complex, for any factors that are not related to his management as an intermediate, the same way the clients will be responsible for their safety in using the mentioned facilities. RESOLUTION OF CONTRACT. The owner is entitled to terminate the contract in the following situations: 1. The excessive number of occupants in an accommodation, for which the owner may ask for the name and ID of each one of them at any point. 2. The transfer or subletting of the entire or part of the subject of this contract; 3. The changing of the furniture location within the accommodation; 4. The performance of any activity that contravenes the municipal regulations, the cohabitation regulations, the hygiene ones and the common public rules or of activities that deprive other tenants of the accommodation, complex or urbanization of rest. EXCLUDED LIABILITIES. The owner is not to be held responsible in the following situations: 1. Any theft, loss or damage that the clients may suffer during their stay in the rented accommodation, even in cases when they also rented a safe deposit box in their room. 2. Supply cuts from the larger companies such as electricity, gas or water; 3. The breakage of electromechanics or any other type of appliance in the accommodation will be reported to the owner and he will contact the Technical Department in less than 24 hours, but the lack of assistance from their part shall not be grounds for compensation from the owner. 4. Works that are developed by the city hall or any other institutions besides the owner's company, can be conducted nearby or in the same building and may affect the regular demarche of the tenant's stay. 5. The WiFi service comes from external companies that do not cover all of the apartments that the owner manages, thus in case the connection is deficient, the owner will refund the amount charged for the said service, prior to the supplier's authorization, without the client being able to blame the owner for the lack of connection. In case the client rents an accommodation and the said accommodation cannot be put at his disposal, the owner takes it upon himself to offer the client another accommodation of similar or higher category and in case the client is not satisfied with it, the amount of money that was paid to the owner for his intermediate management will be refunded. Option booking not available Please note: the rates do not include the mandatory hirers' liability insurance. This small amount is a percentage of the rental sum starting from 10 Euros per reservation. This accommodation is located in Santa Margarita's Urbanization, just 5 min by car from the Centre of Roses. It has a capacity for 6 people. The beach of fine sand and one of the most crystalline waters of all the Girona Coast is located 200 meters from the apartment, where you can practice water sports. Nearby there are all kinds of shops and restaurants where you can taste the best seafood of the Roses Bay. Ideal to enjoy in family or with friends of the multiple opportunities that offers la Costa Brava. Option booking not available Please note: the rates do not include the mandatory hirers' liability insurance. This small amount is a percentage of the rental sum starting from 10 Euros per reservation. This cozy and newly constructed holiday apartment is located in Rosas, on the Costa Brava, in the province of Gerona, Catalonia. The accommodation is part of a suburban neighborhood and lies just 1.50 km from the sandy beach, 2.50 km from the city center and bus station, 0.70 km from a supermarket and 20 km from the train station. Rosas is located on the northern coast of the Gulf of Roses, south of Cape Creus and is a major tourist center with modern hotels, beautiful beaches and two ports (fishing and yachting). The coast of Roses includes a long sandy beach while further east you'll find a large number of coves, among them Canyelles Petites, L'Almadrava, Cap Norfeu, Punta Falconera, Jóncols and Montjoi. Some of its beaches have received the Blue Flag award, a symbol of the quality of their environment. This apartment is suitable for up to 6 persons and has an area of 65 m². There are two bedrooms, one of them furnished with a double bed, the other with two single beds. The cozy living room features a double bed sofa. The accommodation has a bathroom with a bathtub, sink and toilet. The open kitchen is equipped with an electric hob, refrigerator, microwave, washing machine, dishes/cutlery, kitchen utensils and coffee maker. Furthermore, this accommodation is provided with the following ameneties: an elevator, terrace with garden furniture, iron, shared swimming pool + children's pool, covered car parking in the same building and a TV. The apartment is located on the first floor. Roses is an essentially Mediterranean town with a notable tourist and seafaring tradition. It occupies a unique natural setting, in the northern part of the Costa Brava, less than 30 km from the French border, 65 km from Girona and 160 km from Barcelona. The major tourist center, with housing developments, hotels, beaches and two ports (fishing and sports), is an attractive place within the northern sector of the Costa Brava. The coastline of Roses includes a long sandy beach. Roses is a bustling town year round. Its range of activities and attractions is very appealing to all types of travelers. Drive a go-kart, enjoy a day at the water park, play mini-golf, take a boat trip to Cape Creus or a ride on a tourist train – these are just some of the possibilities Roses offers for your leisure time enjoyment. IMPORTANT: After making the reservation, please send us the following information: complete name, passport or ID number and date of birth for all tenants. RENTAL COST. The rental cost is the one indicated in the particular conditions of the booking's confirmation or contract, where the costs for rent, administration and all the extra services that the client has contracted are stated. RECEIVING THE KEY. When he is handed the key the client will pay the rest of the amount stipulated in the reservation contract, in cash only, and will sign the corresponding holiday rental agreement for the contracted period. RENTING PERIOD. The period for which the accommodation is rented is specified in the contract's private conditions, the keys will be handed between the hours of 16:00 and 20:00 from the first day of the contracted period, in case it is absolutely impossible for the client to arrive within the above mentioned hours, there will be a 50,00 € fee and the owner has to be informed with regards to the foreseen arrival time so the staff can adjust to the mentioned schedule changes. We do not hand over the keys after 22h, in case the client arrives later, he will have to pick up the key the next day in the morning. In any other case the owner is free from any obligations, the lessee losing the payment that he made when confirming the booking. The departure will be on the established day before 10:00 am, the owner has to be informed 24 hours in advance with regards to the exact hour of departure, the tenant being responsible for leaving the accommodation keys in our office and also for leaving the accommodation in the same condition as found. DEPOSIT. When handed the keys, the tenant will sign a document that authorizes the company to charge a fee from his credit card for the amount indicated as a warranty. At the end of his stay, the client agrees to turn in the accommodation, the furniture and the utilities in the same condition they were found in, making himself responsible for any damages that occur during his stay as a result of his actions including damages caused by any pets. Otherwise, the amount corresponding to cleaning, fixing or substituting any of such damages will be taken from the warranty deposit. ADMINISTRATION COSTS. The contract issuance costs are included in it, under the name of "administrative expenses" and the amount per day is of 6,00 € / day. SUPPLIES. The costs for supplies are included in the total price except for special cases that will be personally communicated to the client. In accommodations whose provisions are gas bottles and these become empty, the client has to contact the owner and take the bottle to him within opening hours, so that he can get a new one. COMMUNITY STANDARDS. The accommodations that are located in a community, with neighbors around, will have their own rules and regulations and/or ones of the community. If there are any community facilities like a pool, tennis courts, etc… they are not opened throughout the entire year, the dates in which they are open or closed depend on the weather, number of guests, hygiene routine and other factors. For this reason the owner will not be responsible for such facilities not being open within a community complex, for any factors that are not related to his management as an intermediate, the same way the clients will be responsible for their safety in using the mentioned facilities. RESOLUTION OF CONTRACT. The owner is entitled to terminate the contract in the following situations: 1. The excessive number of occupants in an accommodation, for which the owner may ask for the name and ID of each one of them at any point. 2. The transfer or subletting of the entire or part of the subject of this contract; 3. The changing of the furniture location within the accommodation; 4. The performance of any activity that contravenes the municipal regulations, the cohabitation regulations, the hygiene ones and the common public rules or of activities that deprive other tenants of the accommodation, complex or urbanization of rest. EXCLUDED LIABILITIES. The owner is not to be held responsible in the following situations: 1. Any theft, loss or damage that the clients may suffer during their stay in the rented accommodation, even in cases when they also rented a safe deposit box in their room. 2. Supply cuts from the larger companies such as electricity, gas or water; 3. The breakage of electromechanics or any other type of appliance in the accommodation will be reported to the owner and he will contact the Technical Department in less than 24 hours, but the lack of assistance from their part shall not be grounds for compensation from the owner. 4. Works that are developed by the city hall or any other institutions besides the owner's company, can be conducted nearby or in the same building and may affect the regular demarche of the tenant's stay. 5. The WiFi service comes from external companies that do not cover all of the apartments that the owner manages, thus in case the connection is deficient, the owner will refund the amount charged for the said service, prior to the supplier's authorization, without the client being able to blame the owner for the lack of connection. In case the client rents an accommodation and the said accommodation cannot be put at his disposal, the owner takes it upon himself to offer the client another accommodation of similar or higher category and in case the client is not satisfied with it, the amount of money that was paid to the owner for his intermediate management will be refunded. Option booking not available Please note: the rates do not include the mandatory hirers' liability insurance. This small amount is a percentage of the rental sum starting from 10 Euros per reservation. This cozy and newly constructed holiday apartment is located in Rosas, on the Costa Brava, in the province of Gerona, Catalonia. The accommodation is part of a suburban neighborhood and lies just 1.50 km from the sandy beach, 2.50 km from the city center and bus station, 0.70 km from a supermarket and 20 km from the train station. Rosas is located on the northern coast of the Gulf of Roses, south of Cape Creus and is a major tourist center with modern hotels, beautiful beaches and two ports (fishing and yachting). The coast of Roses includes a long sandy beach while further east you'll find a large number of coves, among them Canyelles Petites, L'Almadrava, Cap Norfeu, Punta Falconera, Jóncols and Montjoi. Some of its beaches have received the Blue Flag award, a symbol of the quality of their environment. This apartment is suitable for up to 6 persons and has an area of 65 m². There are two bedrooms, one of them furnished with a double bed, the other with two single beds. The cozy living room features a double bed sofa. The accommodation has a bathroom with a bathtub, sink and toilet. The open kitchen is equipped with an electric hob, refrigerator, microwave, washing machine, dishes/cutlery, kitchen utensils, coffee maker and toaster. Furthermore, this accommodation is provided with the following ameneties: an elevator, terrace with garden furniture, iron, shared swimming pool + children's pool, covered car parking in the same building and a TV. The apartment is located on the first floor. Roses is an essentially Mediterranean town with a notable tourist and seafaring tradition. It occupies a unique natural setting, in the northern part of the Costa Brava, less than 30 km from the French border, 65 km from Girona and 160 km from Barcelona. The major tourist center, with housing developments, hotels, beaches and two ports (fishing and sports), is an attractive place within the northern sector of the Costa Brava. The coastline of Roses includes a long sandy beach. Roses is a bustling town year round. Its range of activities and attractions is very appealing to all types of travelers. Drive a go-kart, enjoy a day at the water park, play mini-golf, take a boat trip to Cape Creus or a ride on a tourist train – these are just some of the possibilities Roses offers for your leisure time enjoyment. IMPORTANT: After making the reservation, please send us the following information: complete name, passport or ID number and date of birth for all tenants. RENTAL COST. The rental cost is the one indicated in the particular conditions of the booking's confirmation or contract, where the costs for rent, administration and all the extra services that the client has contracted are stated. RECEIVING THE KEY. When he is handed the key the client will pay the rest of the amount stipulated in the reservation contract, in cash only, and will sign the corresponding holiday rental agreement for the contracted period. RENTING PERIOD. The period for which the accommodation is rented is specified in the contract's private conditions, the keys will be handed between the hours of 16:00 and 20:00 from the first day of the contracted period, in case it is absolutely impossible for the client to arrive within the above mentioned hours, there will be a 50,00 € fee and the owner has to be informed with regards to the foreseen arrival time so the staff can adjust to the mentioned schedule changes. We do not hand over the keys after 22h, in case the client arrives later, he will have to pick up the key the next day in the morning. In any other case the owner is free from any obligations, the lessee losing the payment that he made when confirming the booking. The departure will be on the established day before 10:00 am, the owner has to be informed 24 hours in advance with regards to the exact hour of departure, the tenant being responsible for leaving the accommodation keys in our office and also for leaving the accommodation in the same condition as found. DEPOSIT. When handed the keys, the tenant will sign a document that authorizes the company to charge a fee from his credit card for the amount indicated as a warranty. At the end of his stay, the client agrees to turn in the accommodation, the furniture and the utilities in the same condition they were found in, making himself responsible for any damages that occur during his stay as a result of his actions including damages caused by any pets. Otherwise, the amount corresponding to cleaning, fixing or substituting any of such damages will be taken from the warranty deposit. ADMINISTRATION COSTS. The contract issuance costs are included in it, under the name of "administrative expenses" and the amount per day is of 6,00 € / day. SUPPLIES. The costs for supplies are included in the total price except for special cases that will be personally communicated to the client. In accommodations whose provisions are gas bottles and these become empty, the client has to contact the owner and take the bottle to him within opening hours, so that he can get a new one. COMMUNITY STANDARDS. The accommodations that are located in a community, with neighbors around, will have their own rules and regulations and/or ones of the community. If there are any community facilities like a pool, tennis courts, etc… they are not opened throughout the entire year, the dates in which they are open or closed depend on the weather, number of guests, hygiene routine and other factors. For this reason the owner will not be responsible for such facilities not being open within a community complex, for any factors that are not related to his management as an intermediate, the same way the clients will be responsible for their safety in using the mentioned facilities. RESOLUTION OF CONTRACT. The owner is entitled to terminate the contract in the following situations: 1. The excessive number of occupants in an accommodation, for which the owner may ask for the name and ID of each one of them at any point. 2. The transfer or subletting of the entire or part of the subject of this contract; 3. The changing of the furniture location within the accommodation; 4. The performance of any activity that contravenes the municipal regulations, the cohabitation regulations, the hygiene ones and the common public rules or of activities that deprive other tenants of the accommodation, complex or urbanization of rest. EXCLUDED LIABILITIES. The owner is not to be held responsible in the following situations: 1. Any theft, loss or damage that the clients may suffer during their stay in the rented accommodation, even in cases when they also rented a safe deposit box in their room. 2. Supply cuts from the larger companies such as electricity, gas or water; 3. The breakage of electromechanics or any other type of appliance in the accommodation will be reported to the owner and he will contact the Technical Department in less than 24 hours, but the lack of assistance from their part shall not be grounds for compensation from the owner. 4. Works that are developed by the city hall or any other institutions besides the owner's company, can be conducted nearby or in the same building and may affect the regular demarche of the tenant's stay. 5. The WiFi service comes from external companies that do not cover all of the apartments that the owner manages, thus in case the connection is deficient, the owner will refund the amount charged for the said service, prior to the supplier's authorization, without the client being able to blame the owner for the lack of connection. In case the client rents an accommodation and the said accommodation cannot be put at his disposal, the owner takes it upon himself to offer the client another accommodation of similar or higher category and in case the client is not satisfied with it, the amount of money that was paid to the owner for his intermediate management will be refunded. Option booking not available Please note: the rates do not include the mandatory hirers' liability insurance. This small amount is a percentage of the rental sum starting from 10 Euros per reservation. Spacious and comfortable apartment with capacity for 6 people. It is situated in the urban center of Roses, nearby there are all kinds of shops and restaurants where you can enjoy the best fresh fish and seafood from the Roses Bay. The sandy beach is just at 350 meters and it's one with the most crystalline waters of the Girona Coast. Ideal to enjoy in family or with friends of the multiple possibilities that offers la Costa Brava. Option booking not available Please note: the rates do not include the mandatory hirers' liability insurance. This small amount is a percentage of the rental sum starting from 10 Euros per reservation. This accommodation is in one of the most idyllic areas of the Girona Coast, located 5 minutes walking from Canyelles Petites Beach and 5minute driving from the Centre of Roses. It is a comfortable apartment with capacity for 4 people and has a private terrace where you can see the magnificent views of the Roses Bay. Ideal to enjoy in family or with friends of the multiple opportunities that offers la Costa Brava. Option booking not available Please note: the rates do not include the mandatory hirers' liability insurance. This small amount is a percentage of the rental sum starting from 10 Euros per reservation. Pujada Puig Rom 184 Villa 2 Pool. The house in Rosas / Roses has 2 bedrooms and has capacity for 6 people. The house is nicely furnished, and has 44 m². It has views to the sea. It is located 3 km from Distance to the beach sand beach, 3 km from Distance to the city city, 3,50 km from Distance to the supermarket supermarket, 4 km from Distance to the bus stop bus station. The house is situated in a quiet neighborhood in a residential complex. The accommodation is equipped with the following things: private swimming pool, TV. In, refrigerator, microwave, oven, washing machine, dishes/cutlery, kitchen utensils, coffee machine are provided. Roses is a major tourist center with modern hotels, beautiful beaches and two ports (fishing and yachting). The coast of Roses includes a long sandy beach while further east you'll find a large number of coves, among them Canyelles Petites, L'Almadrava, Cap Norfeu, Punta Falconera, Jóncols and Montjoi. Some of its beaches have received the Blue Flag award, a symbol of quality for having a clean and safe environment. Bedrooms: 2 Capacity: 6 - 1 Double beds, 2 Single beds. Living room: - TV Kitchen: - Refrigerator, Microwave, Oven, Dishes / Cutlery, Utensils / Kitchen, Coffee. Bathrooms: - 1 bathroom with shower. Views: - Sea. General: - 1 Floor, Swimming pool Private (dimensions 10x10 m), 44 m² Living area Roses is an essentially Mediterranean town with a notable tourist and seafaring tradition. It occupies a unique natural setting, in the northern part of the Costa Brava, less than 30 km from the French border, 65 km from Girona and 160 km from Barcelona. The major tourist center, with housing developments, hotels, beaches and two ports (fishing and sports), is an attractive place within the northern sector of the Costa Brava. The coastline of Roses includes a long sandy beach. Roses is a bustling town year round. Its range of activities and attractions is very appealing to all types of travelers. Drive a go-kart, enjoy a day at the water park, play mini-golf, take a boat trip to Cape Creus or a ride on a tourist train – these are just some of the possibilities Roses offers for your leisure time enjoyment. IMPORTANT: After making the reservation, please send us the following information: complete name, passport or ID number and date of birth for all tenants. RENTAL COST. The rental cost is the one indicated in the particular conditions of the booking's confirmation or contract, where the costs for rent, administration and all the extra services that the client has contracted are stated. RECEIVING THE KEY. When he is handed the key the client will pay the rest of the amount stipulated in the reservation contract, in cash only, and will sign the corresponding holiday rental agreement for the contracted period. RENTING PERIOD. The period for which the accommodation is rented is specified in the contract's private conditions, the keys will be handed between the hours of 16:00 and 20:00 from the first day of the contracted period, in case it is absolutely impossible for the client to arrive within the above mentioned hours, there will be a 50,00 € fee and the owner has to be informed with regards to the foreseen arrival time so the staff can adjust to the mentioned schedule changes. We do not hand over the keys after 22h, in case the client arrives later, he will have to pick up the key the next day in the morning. In any other case the owner is free from any obligations, the lessee losing the payment that he made when confirming the booking. The departure will be on the established day before 10:00 am, the owner has to be informed 24 hours in advance with regards to the exact hour of departure, the tenant being responsible for leaving the accommodation keys in our office and also for leaving the accommodation in the same condition as found. DEPOSIT. When handed the keys, the tenant will sign a document that authorizes the company to charge a fee from his credit card for the amount indicated as a warranty. At the end of his stay, the client agrees to turn in the accommodation, the furniture and the utilities in the same condition they were found in, making himself responsible for any damages that occur during his stay as a result of his actions including damages caused by any pets. Otherwise, the amount corresponding to cleaning, fixing or substituting any of such damages will be taken from the warranty deposit. ADMINISTRATION COSTS. The contract issuance costs are included in it, under the name of "administrative expenses" and the amount per day is of 6,00 € / day. SUPPLIES. The costs for supplies are included in the total price except for special cases that will be personally communicated to the client. In accommodations whose provisions are gas bottles and these become empty, the client has to contact the owner and take the bottle to him within opening hours, so that he can get a new one. COMMUNITY STANDARDS. The accommodations that are located in a community, with neighbors around, will have their own rules and regulations and/or ones of the community. If there are any community facilities like a pool, tennis courts, etc… they are not opened throughout the entire year, the dates in which they are open or closed depend on the weather, number of guests, hygiene routine and other factors. For this reason the owner will not be responsible for such facilities not being open within a community complex, for any factors that are not related to his management as an intermediate, the same way the clients will be responsible for their safety in using the mentioned facilities. RESOLUTION OF CONTRACT. The owner is entitled to terminate the contract in the following situations: 1. The excessive number of occupants in an accommodation, for which the owner may ask for the name and ID of each one of them at any point. 2. The transfer or subletting of the entire or part of the subject of this contract; 3. The changing of the furniture location within the accommodation; 4. The performance of any activity that contravenes the municipal regulations, the cohabitation regulations, the hygiene ones and the common public rules or of activities that deprive other tenants of the accommodation, complex or urbanization of rest. EXCLUDED LIABILITIES. The owner is not to be held responsible in the following situations: 1. Any theft, loss or damage that the clients may suffer during their stay in the rented accommodation, even in cases when they also rented a safe deposit box in their room. 2. Supply cuts from the larger companies such as electricity, gas or water; 3. The breakage of electromechanics or any other type of appliance in the accommodation will be reported to the owner and he will contact the Technical Department in less than 24 hours, but the lack of assistance from their part shall not be grounds for compensation from the owner. 4. Works that are developed by the city hall or any other institutions besides the owner's company, can be conducted nearby or in the same building and may affect the regular demarche of the tenant's stay. 5. The WiFi service comes from external companies that do not cover all of the apartments that the owner manages, thus in case the connection is deficient, the owner will refund the amount charged for the said service, prior to the supplier's authorization, without the client being able to blame the owner for the lack of connection. In case the client rents an accommodation and the said accommodation cannot be put at his disposal, the owner takes it upon himself to offer the client another accommodation of similar or higher category and in case the client is not satisfied with it, the amount of money that was paid to the owner for his intermediate management will be refunded. Option booking not available Please note: the rates do not include the mandatory hirers' liability insurance. This small amount is a percentage of the rental sum starting from 10 Euros per reservation. Pujada Puig Rom 184 Casa 2. The house in Rosas / Roses has 2 bedrooms and has capacity for 6 people. The house is nicely furnished, and has 44 m². It has views to the sea. It is located 3 km from Distance to the beach sand beach, 3 km from Distance to the city city, 3,50 km from Distance to the supermarket supermarket, 4 km from Distance to the bus stop bus station. The house is situated in a quiet neighborhood in a residential complex. The accommodation is equipped with the following things: TV. In, refrigerator, microwave, oven, washing machine, dishes/cutlery, kitchen utensils, coffee machine are provided. Roses is a major tourist center with modern hotels, beautiful beaches and two ports (fishing and yachting). The coast of Roses includes a long sandy beach while further east you'll find a large number of coves, among them Canyelles Petites, L'Almadrava, Cap Norfeu, Punta Falconera, Jóncols and Montjoi. Some of its beaches have received the Blue Flag award, a symbol of quality for having a clean and safe environment. Bedrooms: 2 Capacity: 6 - 1 Double beds, 2 Single beds. Living room: - TV Kitchen: - Refrigerator, Microwave, Oven, Dishes / Cutlery, Utensils / Kitchen, Coffee. Bathrooms: - 1 bathroom with shower. Views: - Sea. General: - 1 Floor, 44 m² Living area. Roses is an essentially Mediterranean town with a notable tourist and seafaring tradition. It occupies a unique natural setting, in the northern part of the Costa Brava, less than 30 km from the French border, 65 km from Girona and 160 km from Barcelona. The major tourist center, with housing developments, hotels, beaches and two ports (fishing and sports), is an attractive place within the northern sector of the Costa Brava. The coastline of Roses includes a long sandy beach. Roses is a bustling town year round. Its range of activities and attractions is very appealing to all types of travelers. Drive a go-kart, enjoy a day at the water park, play mini-golf, take a boat trip to Cape Creus or a ride on a tourist train – these are just some of the possibilities Roses offers for your leisure time enjoyment. IMPORTANT: After making the reservation, please send us the following information: complete name, passport or ID number and date of birth for all tenants. RENTAL COST. The rental cost is the one indicated in the particular conditions of the booking's confirmation or contract, where the costs for rent, administration and all the extra services that the client has contracted are stated. RECEIVING THE KEY. When he is handed the key the client will pay the rest of the amount stipulated in the reservation contract, in cash only, and will sign the corresponding holiday rental agreement for the contracted period. RENTING PERIOD. The period for which the accommodation is rented is specified in the contract's private conditions, the keys will be handed between the hours of 16:00 and 20:00 from the first day of the contracted period, in case it is absolutely impossible for the client to arrive within the above mentioned hours, there will be a 50,00 € fee and the owner has to be informed with regards to the foreseen arrival time so the staff can adjust to the mentioned schedule changes. We do not hand over the keys after 22h, in case the client arrives later, he will have to pick up the key the next day in the morning. In any other case the owner is free from any obligations, the lessee losing the payment that he made when confirming the booking. The departure will be on the established day before 10:00 am, the owner has to be informed 24 hours in advance with regards to the exact hour of departure, the tenant being responsible for leaving the accommodation keys in our office and also for leaving the accommodation in the same condition as found. DEPOSIT. When handed the keys, the tenant will sign a document that authorizes the company to charge a fee from his credit card for the amount indicated as a warranty. At the end of his stay, the client agrees to turn in the accommodation, the furniture and the utilities in the same condition they were found in, making himself responsible for any damages that occur during his stay as a result of his actions including damages caused by any pets. Otherwise, the amount corresponding to cleaning, fixing or substituting any of such damages will be taken from the warranty deposit. ADMINISTRATION COSTS. The contract issuance costs are included in it, under the name of "administrative expenses" and the amount per day is of 6,00 € / day. SUPPLIES. The costs for supplies are included in the total price except for special cases that will be personally communicated to the client. In accommodations whose provisions are gas bottles and these become empty, the client has to contact the owner and take the bottle to him within opening hours, so that he can get a new one. COMMUNITY STANDARDS. The accommodations that are located in a community, with neighbors around, will have their own rules and regulations and/or ones of the community. If there are any community facilities like a pool, tennis courts, etc… they are not opened throughout the entire year, the dates in which they are open or closed depend on the weather, number of guests, hygiene routine and other factors. For this reason the owner will not be responsible for such facilities not being open within a community complex, for any factors that are not related to his management as an intermediate, the same way the clients will be responsible for their safety in using the mentioned facilities. RESOLUTION OF CONTRACT. The owner is entitled to terminate the contract in the following situations: 1. The excessive number of occupants in an accommodation, for which the owner may ask for the name and ID of each one of them at any point. 2. The transfer or subletting of the entire or part of the subject of this contract; 3. The changing of the furniture location within the accommodation; 4. The performance of any activity that contravenes the municipal regulations, the cohabitation regulations, the hygiene ones and the common public rules or of activities that deprive other tenants of the accommodation, complex or urbanization of rest. EXCLUDED LIABILITIES. The owner is not to be held responsible in the following situations: 1. Any theft, loss or damage that the clients may suffer during their stay in the rented accommodation, even in cases when they also rented a safe deposit box in their room. 2. Supply cuts from the larger companies such as electricity, gas or water; 3. The breakage of electromechanics or any other type of appliance in the accommodation will be reported to the owner and he will contact the Technical Department in less than 24 hours, but the lack of assistance from their part shall not be grounds for compensation from the owner. 4. Works that are developed by the city hall or any other institutions besides the owner's company, can be conducted nearby or in the same building and may affect the regular demarche of the tenant's stay. 5. The WiFi service comes from external companies that do not cover all of the apartments that the owner manages, thus in case the connection is deficient, the owner will refund the amount charged for the said service, prior to the supplier's authorization, without the client being able to blame the owner for the lack of connection. In case the client rents an accommodation and the said accommodation cannot be put at his disposal, the owner takes it upon himself to offer the client another accommodation of similar or higher category and in case the client is not satisfied with it, the amount of money that was paid to the owner for his intermediate management will be refunded. Option booking not available Please note: the rates do not include the mandatory hirers' liability insurance. This small amount is a percentage of the rental sum starting from 10 Euros per reservation. This gorgeous and elevated villa has a luxurious swimming pool and a splendid view over the sea. Your holiday villa is beautifully situated in Roses and has a commanding view of the bay of Roses. The villa has three floors and is furnished with all modern conveniences to guarantee an unforgettable holiday. In the cozy living room you will enjoy that breathtaking view while you unwind. The kitchen is fully furnished and the bedrooms are quaint and spaciously set up. One of the bedrooms has a balcony with view over the bay. Both the bedrooms as well as the living room have air conditioning. Outside you have a lovely terrace and a large private swimming pool. You are in the perfect location to enjoy a splendid and relaxing holiday. It is also ideal to get to enjoy all the beauty of the surrounding area and experience the local gastronomy. The very central location ensures that everything is within reach. There is a gorgeous beach not far away. Go visit the nature reserve of Cap de Norfue or the famous Dali Museum in Figueres (30 km).